Did you know that good is an adjective, and well is an adverb? Good. You are a good student. You write very well. • Arnelia did her homework well. • You speak English very well. Remember: Good students write well. Add good or well to each sentence. Remember: Good students write well.Add good or well to each sentence. This is a ___ lesson. Tanya speaks Japanese very ___. Tanya speaks Japanese very well. Speaks is a verb so an adverb is needed. Tanya’s Japanese is very ___. Tanya’s Japanese is very good. Japanese is a noun, so an adjective is needed. If you are a ___ girl at school today we will go to the park. If you are a good girl at school today we will go to the park. Your exam results were very ___. Your exam results were very good. Did Nobby do ___ in the test? Did Nobby do well in the test? Do is a verb so an adverb is needed. They play very ___ together, don’t they? They play very well together, don’t they? I don’t have a ___ feeling about this. I don’t have a (good) feeling about this. Here feeling is an emotion, so it is a noun. Here smell is a noun. She gave me some ___ advice. She gave me some (good) advice. After eating six sausages he didn’t feel very ___. After eating six sausages he didn’t feel very (well). After eating six sausages he didn’t feel very well. The weather was ___ while we were in Malaysia. The weather was (good) while we were in Malaysia. The weather was good while we were in Malaysia. I didn’t sleep ___ last night. I didn’t sleep (well) last night. I’ve met him a few times, but I don’t know him ___. I’ve met him a few times, but I don’t know him (well). I’ve met him a few times, but I don’t know him well. 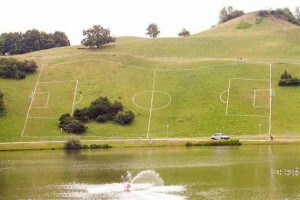 I am a good footballer, but I couldn’t play well on this pitch.